This will likely be the most difficult post I'll ever try to write. As I sit here... with tears streaming down my face... I'm not sure if I can do it. I don't have the words I need. I don't have the strength I need. I'm more broken than I've ever been. I had to send another rescue dog to Heaven. I lost two of my children... in one week. However, despite my pain, each of my dogs deserves to be honored with a special "In Loving Memory" post, written just for them. She's been my baby... for one full year now. On April 27, 2011, Heidi survived the devastating F5 tornado that ripped through the city of Tuscaloosa, Alabama. She managed to survive that storm... alone... outside... on a chain. Heidi had lived on that short chain... all 10 years of her life. She was never able to walk. She was never able to run. She was never able to play. For 10 long years of her life... Heidi never lived. In addition, she'd been forced to endure many other forms of unimaginable torture. When she was younger, her owners made the cruel decision to "crop" Heidi's ears themselves... with scissors or a knife. She'd also been neglected, abused, under-fed, and over-bred... all 10 years of her life. Honestly... Heidi lived one of the saddest existences I could ever imagine. Following the storm, Heidi was rescued from one of the hardest-hit areas. Shortly thereafter, Heidi came to live with me. and I have been her mom. I was lucky enough to spend all day, every day... with my Heidi. It was one of the greatest joys of my life... because Heidi was one of the greatest loves of my life. However... after 10 years of unimaginable torture... Heidi deserved to know love. And... it just so happens... I've got a ton of love to give... and so did Heidi. We were a perfect match. Because... last year, at the moment I saved her... I'd "unofficially" adopted Heidi myself. That day, I looked into her eyes, and made the following promise: "You're home now, baby girl. And from now on --no matter what else happens-- you and me... are family. If it comes down to it, you can live out the rest of your days here with me... and I'll love you every second. I promise." Heidi took me up on my offer. She spent the last year of her life... and the best days of her life... here with me. It was the best year ever. Heidi brought more joy into my life than I could ever put into words. She had the kind of smile that could light up my whole world. She had this beautiful energy that could push me forward. She gave the kind of love that could set my heart on fire. Every day of the past year, Heidi has shared that love with me. And every day of the past year... she finally got to hear, "I love you, back." However... from a health standpoint, Heidi had plenty of issues. So, this past year, I made sure that Heidi received every bit of vet care she needed, every time she needed it. Out of the 11 years she'd been alive. For the first 10, she got nothing she needed, every time she needed it. And eventually, those 10 years of neglect... finally caught up with her. My heart is just too broken to list all of the ailments that would bring me to the painstaking decision... to end Heidi's suffering. And really... at this point... those specifics don't really matter. In short, Heidi was old; she was sick, and she was tired. And that's honestly all that matters. Basically... this week, I realized what Heidi needed from me. Even still, it was almost too much to bear. I was still grieving for my Delilah, and now... I was going to lose my Heidi, too. And yet... the pain of her loss was almost enough to break me. Sure... I could've waited... and said: Sorry Heidi. I know you're suffering, but I just can't handle this right now. But honestly... no matter how much pain I was in... I could never do that to Heidi. I owed her that much... and she deserved that much. So... I called the vet, and made yet-another appointment. I sobbed uncontrollably... as I told them it was for Heidi. Of course, they already knew the reason behind it. They knew that it was time. We took Heidi down to the lake... to let her play as much as her little heart could stand. When we got there, Heidi's excitement was contagious. And even with my shattered heart... I felt an insane-amount of joy. 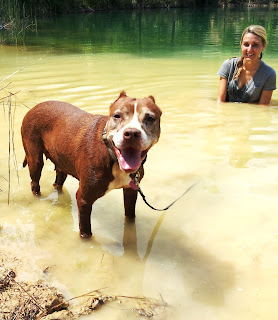 As Heidi stepped into the water, she looked back at me... with this massive smile on her face. Then--without another thought-- I jumped right in with her... fully-clothed in my t-shirt and shorts. Heidi thought that was pretty funny of me. We walked. We swam. We splashed. We played. We smiled. We laughed. We talked. We hugged. We loved. That day... we truly lived. That it was the last day we'd ever spend together. For the rest of my life... I'll cherish every second of that day with her... along with every minute of this year with her. Loving Heidi... was the honor of my lifetime. Soon... when Heidi got tired of playing, we headed back to Lucky Dog. Then, Caycee offered to dig a grave for Heidi in the Lucky Dog pet cemetery. "No, Ash. Please let me do this for you." So, as Caycee left for grave digging, I walked inside, sat on the floor, and sobbed... as quietly as I could. I didn't want Heidi to hear me. When Caycee had been digging for at least an hour... the thunderstorm hit. Suddenly, it was pouring... harder than it's ever poured before. I ran outside, looked out in the distance, and saw Caycee... drenched from head-to-toe... and still digging. I called out to her: "Caycee! Please stop digging and come inside!" She yelled back: "No! I'm okay!" Caycee is such an incredible friend to me. She only refused to let me help her... because she didn't want me to dig the very-grave... where I'd soon bury my own child. She wanted to take that pain from me, and she'd wanted to do something special for Heidi. Regardless... I wasn't leaving her out there alone, any longer. So... I ran out into the storm... to go help my friend. That's when I saw her... head hung low... walking back... through the rain. She was completely soaked... so it took me a minute to realize... that Caycee was sobbing. She said: "Heidi's grave is filling-up with water! I tried to get it out, but it just keeps coming in! I don't want to put her in there like that! I don't want to do that to Heidi!" The tears welled-up in my eyes, as I said: "I'm so sorry. We'll fix it. I promise." Then... we stood there... hugging and sobbing... in the pouring rain. When the time came, we loaded Heidi into the car, and headed to the vet. With the rain beating down on my windshield... and the tears filling my eyes... I almost couldn't see the road. Caycee said: "Okay, pull over. I'm driving." I wiped my eyes, and said: "No. I need to do this. Plus, we're almost there." When we pulled up at the clinic, I laid my head on the steering wheel, and sobbed. "I don't think I can do this..."
She tearfully said: "I'll be there with you." I cried: "But... this is Heidi! How can I say goodbye to Heidi?? It's just... I love her so much." She replied: "Heidi knows that, and she loves you so much, too." So, I wiped my tears, opened the door, and stepped out into the rain. Then... Caycee and I took Heidi inside... for the last time. As I headed toward the exam room, the vet tech was waiting with a box of tissues, and quietly said: "I'm so sorry, Ash." I mustered the words: "Thank you." In the room, Caycee and I waited for Doc to come in. Meanwhile, I sat on the floor with Heidi, and she gently laid her head on my shoulder. And you were a damn-good dog." "I'm right here, Heidi-Boo. It's okay." So... I leaned down, and gave my Heidi one last hug... one last kiss... and whispered one last "I love you." As she took her final breath. Heidi is in Heaven now. That's when Doc stepped outside of the room, to give us a minute alone with her. I'd ever see my Heidi. Shortly thereafter, Doc carried Heidi to my car. Her body was wrapped in bags... and baby blankets. And once again... I lost it. I couldn't talk; I couldn't see; I couldn't breathe. I felt broken. I felt empty. I felt... dead. At this point, it was still pouring outside. So, Caycee drove us home, while I curled up in the passenger seat, and bawled like a baby. Then, Caycee broke the silence, simply saying: "I have so much respect for you today. You are so strong, Ash." In a tiny voice... that didn't sound quite like my own... I replied: "I don't feel so strong, Caycee..."
She said: "I know you don't, but you are." "Wait here. I'll be right back." I knew what she was doing. She was checking Heidi's grave for standing-water, and she didn't want me to see. But luckily, it had all been absorbed by the earth. A few minutes later... we laid Heidi in the ground. Seeing her down there... I could barely contain myself. I was bawling... I was shaking... I was weak. Then... Caycee picked up the shovel... looked at me, and said: "I'll go slow, okay?" I nodded: "Okay. Thank you." Once again... I lost it. I wanted to scream: "No!!! Please! Stop! That's my baby in there!!!" And my world was crumbling around me. It's a moment that I'll always remember... no matter how much I'd like to forget it. That my Heidi was gone forever. Where my Heidi used to be. Afterward... for a while... Caycee and I just stood there... in the rain... in silence. At some point, I looked at Caycee, and said: "I couldn't have gotten through today without you." She replied: "I know... and I wouldn't have let you." Honestly... at that point... it's all we knew how to do. It was dark... and quiet... and peaceful. I sat on the ground, in silence. I looked at the stars. I picked at the grass. I stared at Heidi's grave. I guess I just wanted to feel close to her. I didn't try to wipe them. I just let them fall. I kinda wanted her... to talk back to me. And she couldn't say the words. And Heidi won't be there. But she'll never be there to greet me. that my Heidi was really gone. May God Bless You Ashley and your beautiful Heidi. Thank you for all you did for Heidi, and all the creatures you touch and help. I just wiped the tears from my eyes, your words made me think of my dog Lason that i just resured from a Walmart parking lot. Almost two weeks in his new permanent home, makes me wonder what he thinks being here and where he might be if I hadn't take him into my car that night? Makes me wonder what thoughts he might have to his first four months of life and what he thinks now? God bless & know Heidi trusted what you did was for the best! I am so sorry for the loss of Heidi.She is with St. Francis of Assisi.He is the saint of all animals.He is suffering no longer.When I lost my sheltie to cancer in '97, I still have those flashbacks of him.I have not been able to replace him.Now I cannot due to financial problems. So I will try to find a job pet sitting. You were a wonderful mother to her and she'll never foreget that.You were the only one who cared! !God bless you. Thank you for taking such good care of those babies that otherwise would not have been cared for! My heart goes out to you. Sorry for your loss!!! I'm so, so sorry for your loss of Heidi, you're little girl. You gave her the best life in a very short time. She is in Heaven now romping with the others and NO PAIN AND SUFFERING. Heidi will always be with you. They all are. I rescue/adopt and have lost a few myself. I know your pain, but you know you did the right thing. She told you it was time, just by the way she looked at you. They let you know and being the caring and loving mother that you are, you knew. You'll see her again when she comes running to you when you arrive. God Bless you Ashley and Caycee. I am sitting here sobbing for you and your Babygirl Heidi. I know this is one of the hardest things someone has to do in their life for their pet. But just knowing that Heidi had a better 1 year than all the 10 before makes me feel a little better. She felt all the love that she could possibly hold in that 1 year and I'm sure she thanked you in many ways and you felt her love. 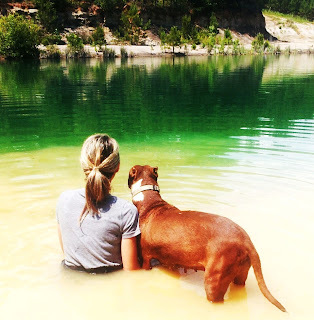 Thank you for giving 1 of the many as full a life as you could possibly give her in the time she had left and thank you for sharing the beautiful tribute to beautiful Heidi. My heart is breaking for you Ashley. I am just so grateful that you gave Heidi the most wonderful year of her life. Keep doing what you are doing for these animals that so deperately need you. Thank you. Rest in peace Heidi. This story is so sad it made me ball like a baby. My boyfriend told me to stop reading it because I kept crying and I told him that when you love your pets so much like you do, its devestating when you lose one because they are your kids. I will be a mess when my dogs pass because like you they are my world! Just remember it takes a strong woman to be a GREAT dog mommy like you are!!!!!! My heart goes out to you. Every dog I have rescued and then lost broke my heart. What a sweet and loving story. You gained when you rescued her, Heaven gained when you lost her. The bittersweet will keep you going. It does me. Many Blessings. So sorry for your loss. Twice in one week can break even the strongest. You've made me cry with both of your posts. I sit here with my 11 month old american bulldog crying softly into her neck and all the wants to do is lick my face. Keep doing what you do, too many others need you and your love. I'm very sorry for your loss. Just remember what a great year you gave Heidi. God Bless You. Ash, your words are a beautiful, fitting tribute to such a beautiful girl. I am so sorry about Heidi, but I am so very glad you gave her such a beautiful year. She deserved it. You are a wonderful person, Ash. God bless you, God bless Heidi. I know how you feel Ash. When I lost my Jake in 2009, my BEST FRIEND, I didn't know how I would go on. Somehow I managed, I don't know how. I have his pictures all around the house. I had him cremated and I have his urn in my living room on the entertainment center. I say good morning and good night to him every single day. Thank you. Thank you for your kind and loving heart. Thank you for giving Heidi the most wonderful year of her life. Thank you for so eloquently sharing your love and devotion with us. Thank you for being brave and strong and selfless for Heidi's sake. Thank you for being willing to suffer the devastating loss that losing a beloved dog brings, even though you know with each one that you will suffer it. Thank you for being you. I am so so sorry for your loss Ashley. 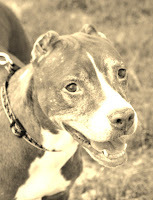 You gave so much love to this dog, love that had been absent for the first 10 years of her life. Most people would walk away from the situation and think there's nothing they could do. But you were brave enough to take her under your wing and be her angel for the last year. The world needs more brave and caring people like you. Although your little girl may be gone in her physical form, her spirit will always be in your heart and now the hearts of many because you shared her story. Hang in there and please don't ever stop what you are doing for the dogs. I too know the pain and heartbreak of the loss of a pet...my friends. My heart goes out to you in this sad time. May God bless you and help your heart to heal...and to know that Heidi is embraced in God's loving arms. Ashley, I am so sorry for your loss. What you did for Heidi was the best thing anyone could have done for her. You gave her the best year of life. A year that she felt love and safe. She got to be a happy dog, if only for a year. My heart breaks for and and Heidi both. May God bless you. I am so sorry. I was just reading her bio earlier this week, and seriously wondered if you would do an out of state adoption...drive from Az to Miss..but I have a soft spot for seniors, and that precious girl deserved a home for whatever time she had left. I wanted to give that to her, but you did. Home is where the heart is, and Heidi's heart was definitely with you. I'm so sorry, Ashley. As usual, you have brought me to tears. I know it's little consolation when you're hurting so bad, but, I am so happy that Heidi had you the last year of her life. As hard as it is to lose her, I just think how much more sad it would be if she had died on the end of that chain, never knowing love, compassion, gentleness, or fun. Never knowing anyone cared about her. YOU gave her that, and while your love for her makes it that much harder to lose her, it was a HUGE gift for her. My heart aches for you, I have an immense amount of respect for following your dreams with running your rescue. I've always wanted to do that but time and space and other responsibilities haven't lined up yet. So, I do what I can. I love my job, I'm a Registered Vet Tech, which allows me to spend time helping animals, and I do as much with rescue as I can. Sharing homeless animals on Facebook and volunteering for shelters, but, I haven't given up hope of running my own rescue someday. God bless you, you'll be in my thoughts and prayers. You took her pain away and made it your own. The earth absorbed the rain, drew in the water as it will enfold Heidi, and from those things life will spring anew. One of our biggest fears in loss is that the memory of our loved one will somehow fade over time. Thankfully the hurt disappears, all to slowly it seems, but Heidi is forever a part of you and as you graciously shared her with us, now a piece of her lives within so many other hearts as well. So sorry Ashley. You are so strong and have such a beautiful soul. Heidi will live forever in your heart and in your work. Only wish you would have had more time with her. You are an inspiration to many! I am crying so hard after reading this blog...tears of joy that Heidi at least had one great year of life, but tears of sadness for you that she is gone. I have two rescued cats right now that are almost ten years old and I know that someday in the future I will have to make the decision that you made and I hope I have the strength you had to say, "Good-bye" so that they don't have to suffer anymore. Thank God there are people like you on this Earth. Animals give us so much more love than we give them and all they want is to be loved and taken care of in return. How people can mistreat them is so out of my realm of understanding. Good-bye, Heidi, you were a great dog and now you will never suffer again. My thoughts are with you on this sad day. Just a thought.....Heidi has been in heaven from the moment you gave her "life". You are and amazing women. Never change, you simply inspire us all. I feel your loss. I lost my Bitsy over 3 years ago & miss her every day. I saved another puppy just before I lost her & I love her soooo much. I wanted to die with my Bitsy. I don't know what I will ever do if something happens to my Chloe. Just know that Heidi loved you & was thanful for the last year of love that you gave her. This is a very hard decision you had to make but you did what was best for her as she was suffering. But, know you gave her a year of love & happiness, that she did not have before. I've had to make that decision twice for my Chow girls a long time ago and I will have to (I hope not though)make that again as I have 2 seniors, a Rott since a puppy and a Dachshund who I adopted 15 yrs ago. Know also everyone that has gone before us, we will be together again. Just finished reading your tribute to Heidi---oh how lucky she was to have you to give her lifetime of love in one short year and how lucky you are to have been the recipient of her unconditional love. I feel your pain and my heart goes out to you and especially with the loss of 2 furkids so close together. Have your previous posts and love them all...thanks for all you do for dogs and "DOG MAMA's" everywhere! Wow, you have a way with words and a an amazingly kind heart. I just bawled like a baby reading this. You are very special and such an inspiration to me. Heidi was incredibly lucky to spend the last year of her life with you. It's not so much how much time you have with them, it's how much they know that you love them. She may have had many years of hardship, but she experienced the love and happiness of a lifetime with you. You held them in your hands, your heart open, fed them with your soul. Love replaced pain, hope replaced despair, and there were they healed. ASHLEY, U ARE AN INSPIRATION TO ALL ANIMAL LOVERS! WHAT A BEAUTIFUL MEMORIAL FOR HEIDI. HEIDI WAS VERY LUCKY TO HAVE HAD YOU FOR THAT LAST YEAR OF HER LIFE. SHE GOT TO KNOW & FEEL WHAT TRUE LOVE WAS. HEIDI IS LOOKING DOWN AT YOU WITH A BIG SMILE & NO PAIN. SHE SAYS THANK YOU FOR HELPING HER TO CROSS OVER TO RAINBOW BRIDGE. Ashley, I am so very sorry for the loss of Heidi. You gave her so much love, and she will be waiting for you with her beautiful smile. You always amaze me, and I pray for peace for you as you try to move forward from this loss. Thank you for loving your furkids so very much. You are an inspiration. I am sorry for your lost of Heidi.. My heart goes out to you.... You'll be in my Thoughts and Prayers and Heidi will be too... She had the best Mom any one could have. You gave her the best care and love.... Take care and God Bless. Beautiful. We can all feel the love you and Heidi shared. You were both very fortunate to find eachother. May she rest in peace and may your heart heal. You are amazing! I know your hurt well and have been there before. I am sorry for your loss and wish you the best. Please be strong. You both had your Day in the Sun like everyone should and just feel blessed that YOU were the one that she spent her last year with. I have a feeling, that it made up for the past ten yrs in her heart. The happiness and love was more than she could have ever dreamed of and so, you made her life, worth living. Bless you and Caycee and all that you have done and still do. The world needs more loving and so very generous people like you. That year you gave such happiness and love to a wonderfully, grateful dog. Even as your heart breaks, may you find comfort knowing Heidi found such boundless love and how life should be. I am still crying reading your post, thank you so much for sharing the wonderful bond Heidi and you share, forever. I recently took in a cat that lost his eye to injury and is FIV+. I definitely try to make everyday count. If he is as happy as Heidi was with you, my heart will be happy. You have a huge heart, thank you so much for giving such love to all that are lucky to cross your path. May all the Heidi's of the world experience the love you shared. As I sit and cry and ache for you and Heidi, All I can say is: You, Ashley, are one of the most amazing women, this is your calling! The love you have for all of your babies,your friends. My words fail me- I am heartbroken for you and Heidi both! Without you they have no one to love them. You give them the love and care they need,want, and deserve! RIP sweet Heidi,you will see your Mom again,one day! Thank you Ashley for sharing this as I know it must have been very difficult to write. There is a very special place for you in heaven where you will all see your babies again! Take peace in knowing that you gave love,you got love and you did what is best for your friend! You feel such pain because you were a good mommy. I share your broken heart. We lost our Mr. Grinch in March and I think of him often and still cry. Am so very sorry for your lose Ashley.Just remember that you gave her a very happy life for one year and she is just a little bit away so you can visit hr and talk to her. I know how hard it can be to loose part of your family and the pain never goes away but it will get easier. Bless you for all that you have done and continue to do. Such an amazingly loving, beautiful and sad story all in one. My prayers are with you! I know you know this but what a special and wonderful you gave Heidi in her last year. You are such an inspiration to me every day and I know that even the things I have been able to do in my own community because of your inspiration aren't as awesome as what you do every day but know that you're making dogs' lives better across America because of your dedication, love and inspiration. I'm so sorry, Ashley. Your post is absolutely beautiful. The love you have for Heidi was absolutely overflowing through your tribute to her. She was lucky to have you for her mom. Ashley-you gave Heidi the best year of her life and she knew it; she knew you loved her. You're such a special person to help all these poor neglected animals and it takes people with a very big heart. She was lucky to have found you! I am so sorry for your loss-twice in 1 week; I can't imagine! You are such a strong person and wonderful person. God Bless you for what you do and just know that Heidi has crossed over the rainbow bridge and she will be waiting to see you again one day! This is a beautiful tribute to Heidi..you are a God send to all these unwanted animals. There are hundreds more out there waiting for your special love..Heidi is whole again w/o pain running & playing with all the others that have gone over the rainbow bridge. God Bless you for all you do! Ashley, though I've never met you, I love you! I've said it before and I'll say it again...you have one of, if not THE, toughest job out there. And you CHOOSE it! I pray that the pain and loss never overcomes your love and passion for these dogs. I tell myself every day that if there was no Heaven, I would not be able to handle all the abuae, neglect, and death. It's just too much to bear without the promises of God. Always let that be a comfort for you. You will see all your babies one day and I bet the the line waiting to greet you will be miles long! :) I'm so sorry your heart is breaking. May God bless You, Your Family, and Your work! I had to put down about 6 animals in my life, and understand Your pain; that pain is very familiar! You are making a great difference in this world! I have helped save so many animals from the streets in my life, by taking them in, or putting them up for adoption in no-kill animal shelters, since I was a child! Currently, I have in my home 7 stray cats, love-birds that were neglected, and a small dog that I took in when he was four and now 7 years old, who was abused and neglected throughout those 4 years! They are my babies, and I love them soo much! I also, help feed the strays outside; there are so many! It breaks my heart! I wish I can take them all in! You are an inspiration! I also, will continue to donate and do everything I can to make a difference in this life with both the sick and poor people, and animals! Your story touched my heart deeply! Take Care! J.C.
Ashley, I feel so much pain for you after reading Heidi's story.....I know all to well the pain of losing animals. I used to do cat rescue and have had to endure the heart breaking pain of losing my babies :-( Although we have never met, I have the utmost respect for you and I think you are a beautiful person to give of your self and of your heart.....not many people can allow their heart to be broken like you do and keep on helping. You are one of God's special angels on earth and the animals that you help are very lucky to have you in their lives. I am glad I found your blog and pet pardons page. Ashley, I'm so sorry for your losses. Losing one is so very difficult, I can not imagine losing two furkids within a week. Heidi was so lucky to have found you. She will always be with you in your heart. She was suffering and you did what was in her best interest. She is now running pain-free at the Rainbow Bridge with Delilah, countless much-loved furkids which include two of my furkids. Thank you for everything that you have done for the dogs. You are truly an angel. Ashley, I am so sorry for your losses. I read each story with tears rolling down my face. I can't imagine the pain you are feeling now. I hope you can take some comfort from the fact that you've rescued and loved so many dogs. You are a very special person doing what you do. Thank you for sharing your stories, both painful and joyful with all of your followers. Bless you Ashley. I can't stop crying. The bigness of your heart is something to be envied. I am so sorry for these heartbreaks, but thank you from the bottom of my heart for all you do. Hi im so sorry for ur loss as i know how u feel march 19th i lost my best friend in life so i know ur pain .ur a swwet person to do what u do i dont know if i could i guess some how i would it would be hard god bless u .. Thank You for the good work you do with helping the pet family !! some day ill help as of now i cant but i hope soon !! So sorry for your loss, can hardly type for the tears. My time will be coming I will need to do the same thing for my two little boys, hope I have a small measure of your courage to do this last final act of love and let them go. Peace be with you. I'm so sorry for your loss as i have tears running down my cheeks. I think you have so much love inside to be able to do this. I don't think I could what you do God Bless you hun for doing this for these loving dogs that have been mistreated or to ill that no one wants. I can only imagine how much you hurt because I just sobbed reading this. I'm sure Heidi looks down on you with her beautiful white wings and thanks you for the most happy and loved year of her life. God Bless you and Lucky Dogs. I will be praying for you and Lucky Dogs. I only wish I could do more. Also you have a beautiful friend to do this with you. God Bless Her. God be with you. Gayle-Ohio. So very sorry for your loss... thinking of the existence Heidi experienced before you saved her is tragic and heartbreaking. You are both lucky to have been there for each other. You, for the unconditional love she so freely gave, and her for the love, security and home you provided that she deserved all along. Thank you for all that you do. I always share your stories, hoping others are inspired by your efforts and compassion the same way I am. Bless you and all of your rescue babies... here and in heaven. If it's any comfort to you at all please know that so many of us are crying with you, feeling your pain, and sharing your loss. The greatest gift we can give our beloved companions is release from pain and suffering, the greatest love is loving them enough to let them go - and yet it is absolutely the hardest thing I have, any of us, have ever done. You are not alone. Please know that there are so many of us reaching out to you now. I am very sorry for your loss. It looks like you gave Heidi the best year of her life. Our pets are so much a part of us that is is very sad to lose them. I lost my cat Misty almost a year ago and still miss her very much. She and Heidi are probably playing together at the Rainbow Bridge. I just want to stay that I appreciate all the work you are doing for Pet Pardons. I am so sorry for all the pain you have had this week,you have more love to give,and have more babies to rescue. No one will ever replace Heidi,and you wouldn't want that,but there will be others that you love differently! Keep your heart open and let Heidi stay in your heart. Know you have done your very best! They need you! We need you! Oh, Ashley, you are such an angel for your babies. I have no doubt that Heidi's last year with you made up for her previous 10 millions of times over. She knew what love felt like, so she was in a really good place when it was her time to go. God bless you for all you do and may he keep your heart strong and help you endure in all you do for these babies. Ashley, I am very sorry for your loss.. You must be such a wonderful person to rescue 2 dogs, and give them a lifetime of love & bonding in 1 year. Heidi is waiting for you at Rainbow's bridge. I'm sure of it. God bless you & give you stregnth to heal. I am so sorry for your loss. I can't imagine the heartbreak you are feeling. I am grateful that Heidi was able to know what a loving family feels like. Just think if she had lived out her life never knowing what love felt like; that would have been awful. Thank you for all you do. This made me bawl my eyes out and I'm still crying. I don't even know what else to say except I am so sorry for your loss and I understand all too well how it feels. When I think about my similar losses I always try to remember that life continues and energy goes on forever and is shared by all. None of our experiences with our loved ones are in vain because out of everything in our lives, those experiences are the most important of all because LOVE is the most important of all. As I sit here for the second time this week and read the rawness of your post it reminds me so much of when I lost two of my babies at age 14 to health issues. I felt myself getting short of breath and my heart aching while reading your story; like it did when I had to make "the" decision. As I arrived at the vet's office with one of my babies who was sick as we walked in and proceeded to the back she suddenly began acting as if nothing was wrong, and she was tried to follow me out of the vet's office when I stepped out to fall apart. She acted as if she were completely fine. I had to stop and question as to whether I was doing the right thing. The vet reminded me of her bloodwork and I knew she was sick. Barely able to hold her head up yet she knew, and I knew what we were there for. The pain I felt made me almost feel like passing out. I couldnt breathe. As the days went on I had dreams of my dogs playing in a meadow free of sickness and old age. My son said Mom they may not be here with us but you will always carry them in your heart. I balled like a baby in front of my 5 year old (at the time ). Such wisdom from a baby. It did give me a sense of peace knowing that I had angel dogs watching over us. It barely lessened the pain. I knew that I was here on this earth to love, and to make a difference in any way that I can in the life of an animal. Ashley, you are here too for that same reason. You have such a big heart with so much love to give, and each dog makes your heart grow so much larger. Please find comfort when you can in knowing that angel dogs are smiling down and remembering who loved them, and who gave them a life.They knew love through you for the first time in their lives. I know you are numb at this moment but I hope that you find peace in being with them whether it be at their grave site or just happy memories in your heart and mind. Thank you for all that you do. Ah sweet girl, as long as you have babies to love you will never be broken. We are behind you. We stand with you. We share your love for all the rescues that no one else wants. You hold a special place in all of our hearts, because you are YOU and you do what most of us cannot. We thank you for your sweet spirit and loving heart. That was the most moving thing I've ever read. I shared tears with you for your sweet Heidi... for all the sweet Heidi's that only knew love for a short time or not at all. You gave her something so special. You finally allowed her to be herself and give her love to someone in return. I am sure she showed her thanks for it every day, but you need to know it was more than amazingly special of you to care for her in her last year. She received everything she needed and more, and she left this world a happy dog. And now she's running gracefully, a pup that will never again have to feel the confines and pain of this world. You are an angel for what you do. You yourself were put here for a reason and that's to give these animals a chance at living. You make an impact in every one of their lives. And one day, you will see them all again in a happier, beautiful place. Hugs to you for your grief and for your strength. Be good to yourself and allow yourself the time you need. Honor your memories and your sorrows, and then always remember her for that wonderful year you allowed her to LIVE! The love you gave her in one year was enough to make up for ten years of pain. She will never truly be gone because the soul does not die and the souls of those we love never leave us behind. She is with you now, tomorrow, and always. The heart can feel what the eyes cannot see. One year with you with your expansive heart was enough to wipe out ten years of misery. One can easily see that in Heidi's face. Your selflessness and bottomless compassion is almost enough to make me forget that there are soulless people like Heidi's owners out there. It's spirit crushing to lose a dog, but we keep going because there's always more that need help. Thank you for all you do. I'm so sorry about Heidi. She was so lucky to have you. We lost our dog Abby to cancer last October and i remember wanting to go with her to. It tore me up inside and I felt horrible and blamed myself for not being able to save her. We had her creamated and planted a hydranga with one of her toys in it in her memory. I sometimes sit beside it and feel she's there with me. 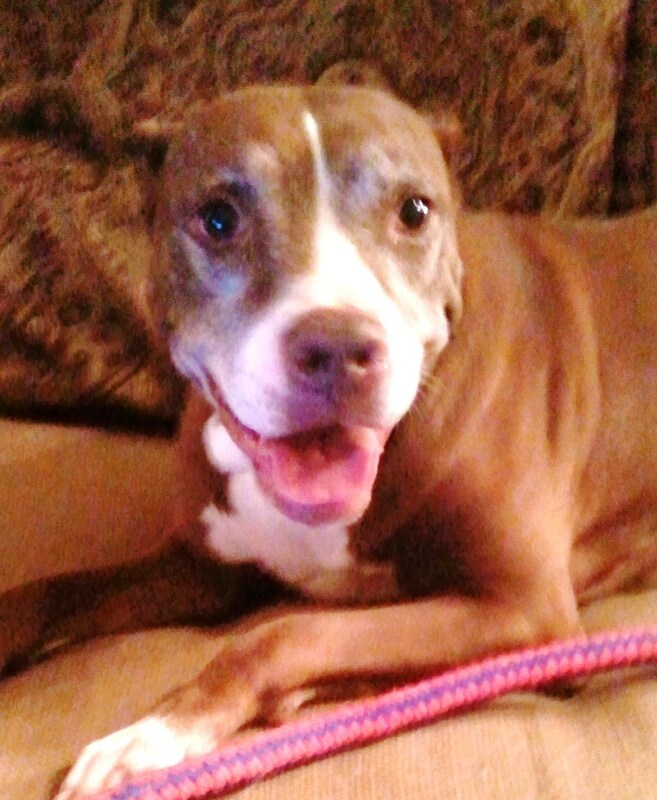 she's at the Rainbow bridge playing and running which she wasn't able to do towards the end. the tumor eventually made her unable to walk or control her bodily functions. I'm sure your Heidi is watching over you now. May she rest in peace and I hope that you find peice to. Im so sorry for your loss.I would donate but i'm only 14. I understand your loss my animals have died too. Heidi seemed ok on your last day together. What was wrong? I just lost another baby. I rescued her. The only love she had was when she found me. Just before that another of my babies died. I wish you the best. Thank you for showing Heidi what 'love' meant and felt like. I am sure her snile shone on you like the sun and your tears on her like the rain. You are truly a wonderful person. OMG...I am weeping for you and Heidi - Take comfort in knowing that you gave her love and joy. Setting her free to run in heaven was your FINAL ACT OF LOVE for her.... Peace. Now go and give that love to another beautiful soul who needs you more than you know. Hugs! Heidi was beautiful. I'm sorry for your loss Doll. A beautiful blog. I am so sorry for your loss. You gave Heidi a lifetime of love in one year. Bless you. That was so beautiful. You are an amazing woman! You are definitely an old soul!!! I am so sorry for your loss! I read your story of Heidi & you through tears and a snotty nose. How heart-warming and heart-breaking. I am SO glad you found each other. To think of what poor Heidi went thru for ten long years is unimaginable. I wonder if the people who abused her so terribly were ever held accountable? And to know that it was only during what was the last year of her life that she was able to experience love and happiness for some reason makes it sadder still. She deserved so much more...they all do. Thank you for following your heart. I am sure you gave her a wonderful year. Ashley, you are an amazing person! I am so sorry for you loss of two wonderful companions. I wish I could do more than just comment. I recently rescued a puppy here in Minnesota, and she is just a big sweetie. She joined our family of 10 cats and one dog. They are all my babies. It is so hard to lose a devoted companion. We lost four in two years, and I still miss them. God bless you for all the fantastic work you do for our four legged friends. God bless you for the wonderful year you gave Heidi. She is waiting for you at the Bridge, she is with you in spirit and her love. My prayers are with you for your loss. Thank you Ashley for everything you do! You are truly amazing. There isn't one post of yours that I read without crying, it's that emotional...We never ever want to lose our "best friend". That is one of the hardest things in life I think we ever have to endure. Thank you for always being there for the dogs who are in dire need of love, once they find you, they are home free! May the God of mercy and love bless you with comfort at this time. You are an angle and you gave Heidi the most wonderful gift, LOVE! I pray everyday that more animals will find their way to loving homes like the one you gave Heidi. I hope that you can find peace knowing that you give these dogs the life and the love that they deserve. God Bless You!!! I'm so sorry for what Hiedi had to go through for way to many years, but in the end she found you to love and take care of her. May you know that you gave her the best last year of her life. I believe in the end we will join them in heaven.Thank for sharing such a difficult day And know that there is a special Place in Heaven for you! I CRIED WITH EVERY WORD I READ. I HAD TO OUT MY BABY DOWN THURSDAY MORNING. I KNOW THE PAIN AND HEARTACHE SHE IS FEELING!!!! IT'S SO HARD TO HAVE TO TAKE THAT LONG DRIVE TO THE VET JUST TO KNOW THAT A LIFE IS ENDING. EVEN THOUGH IT'S THE "RIGHT" THING TO DO. THEY AREN'T SIFFERING ANYMORE, NON THE LESS, WE STILL WANT THEM HERE WITH US. TO PLAY AND CHASE THE BALL OR TO PLAY WITH THE PIECE OF STRING....IT'S SAD AND HEART BREAKING...BUT I KNOW THAT WE WILL BE TOGETHER AGAIN!!! GOD BLESS HEIDI!! BE BLESSED AND KNOW YOUR MOMMIE TRULY LOVED YOU!!!! Sorry Ashley for your loss. I can feel your pain and I thought I could make it through without a tear and all I can do is feel your heart breaking pain. My eyes poured and I bawled for you and For Your 2 babies. It's so hard for you and I am so sorry. But, what does not kill us truely makes us stronger. I also agree with Caycee. Ashley; YOU ARE STRONG BEYOND MEASURE! You provide so much Love, Care, Understanding and Healing to those voiceless, innocent babies you rescue and love to their final moments. Weather it's only a few hours, minutes, week(s) or year(s) YOU provide education and training to those who are open and willing to learn. You are leaving a legacy to our younger generations teaching HUMANITY to them and leading by example. You are so brave to bear your soul as you do. But, I thank you for it. If it were not for you. The outside heartless world would never know the stories of the voiceless lives that are out there. Your followers, supporters and aquaintenances are truely blessed to be in your reach. When you start to focus on all those years she wasn't free, remember the gift of a WHOLE YEAR that you gave her, because I'll bet that's what she focused on. It's always hard to be the one left behind, remembering, wondering, thinking- but be kind to yourself. You are a wonderful being for all that you do. Dear Ashley...Having gone through being there through the end of many a beloved pet companions life, I know the deep ache & sorrow you are feeling at the loss of your Heidi. You write with such realism that I feel as though I was there with you the whole time. Because of your loving care for Heidi in her last year, I believe she probably totally forgot about those tragic beginnings of her life. The only thing that was important to her was YOU & the precious love & care that surrounded her like a sweet warm BLANKET. Your hearts & spirits are forever joined now. You will feel her there when you least expect it. You will think about her & all the memories you & she made together. What a gift you & she were blessed with the moment your paths crossed! God Bless You in the work you have done & will continue to do. You...& Heidi...are inspirations to each of us who now know your stories. I know that I will always be lifted by it. Thank you for that, & for all you do on behalf of all the animals. You did the right thing! I know how much it hurts, I had to do the same thing to 4 of my dogs within a very short time, I feel your pain, but I know they are in a better place and they are not suffering any longer! Thank you for saving sweet Heidi! I'm so sorry to hear of this I know the pain and I cry with you remembering the pain I had to endure when I had to send my baby martika on that same path losing her will hurt forever but I just have to continue to say to myself that she no longer hurts and I will see her again some day as she sits with my mother and all or our beloved pets of the past. I am so sorry for your loss. Thoughts and prayers for you and Heidi. What a beautiful tribute to her. God Bless. I read this post through wet eyes and a snotty nose... I agree with everyone above that you are an amazing person. I just want to say that your heart and your soul are beautiful. Heidi knew more joy in this last year than her previous ten. And, I dare say that you knew more joy in the past year with Heidi in it, than the previous years without her. She lives on in your heart and in the work you do. If you ever feel down-trodden or desperate in your current circumstances, just remember the 10 years Heidi spent on her chain and how she must have felt... little did she know the amazing life that would come. I know that your life as an animal rescuer will not be easy, and certainly will be full of pain, but the best is yet to come. The days of playing with your loved ones fully clothed in a pond are yet to come. The days of eating what you want, doing what you want, and demanding belly rubs are yet to come. ;-) Keep doing what you are you doing because without you, the Heidi's and Delilah's of the world don't get their redemption. You're amazing!! Heidi, Please stay strong. What you do and have done for these babies is awesome. I know how hard it is to make the decision to end a beloved pets life. Without these times of pain and sorrow, we would not apppreciate and cherish the wonderful time spent with our babies - no matter how long or short. Soon you will come across another baby that is going to need lots of love and attention. This will NEVER replace that love in our hearts for these special pups. However, it will ease the pain. It will never close the door of those special places in our hearts for the previous babies but it will open new doors of new places of our hearts for future babies to come. Words cannot express the amount of sympathy that is coming you way during this time of sorrow. May God be with you, ease your pain, heal your heart and give you the strength to carry on. This was one very moving and incredible post to read. Your love for Heidi radiated through your words--however hard it was to type this--it flowed so beautifully. This is my first time visiting your blog, and I have to say I can already tell you have a heart of gold--and you are an amazing person. I can't imagine losing two members of my family in one week, let alone one--and I know this has to be a hard time for you. Take comfort in knowing that Heidi is no longer suffering. She left this world knowing someone LOVED her whole-heartedly. You were a great Momma. I'm saddened by your loss--and yet thankful that you were there for Heidi. Thank you for sharing this--it was much needed today! Ashley, Im so sorry for your loss. I have to tell you thank you through all these tears I am unable to control. My angel nikki has been gone 8 yrs and I never was able to put into words how I felt. You did it, not knowing me you put my heart ache on here for all to see through your loss. I know in my heart that you are a teriific mama to the angels you save, you give them happiness love and the attention all 4 legged babies deserve. All the babies are up there playing together and I hope that my angel has met yours so they can talk about how much of a beautiful person you are. Bless you ashley for giving them love when all they had was abuse. OMG!!!!!!! This is Sooooo SAD!!! I am SO sorry!!!! I can feel the love you 2 shared. My heart aches and i can't stop crying from reading this. OMG!! I am SO sorry!!! Typing this through tears. Although you had to let go of your beloved Heidi, know that you made her time with you preparation for crossing the Bridge and you will meet again. Also, I am sure you realize that there are many Heidis out there waiting for an opportunity to know real love and devotion. Do not hesitate to continue your commitment to provide what they so urgently need. For the past 30 years,every dog I have made a part of my life had been rejected by someone else. They become your most loyal and loving companions regardless of the time you both are given together. God Bless You Ashley! Thank you for helping Heidi and all the sweet, beautiful animals you have helped find homes. I hope you can take solace in the fact that your sweet girl got to experience all the love in the world, even if only for one year. Thank you, Ashley. Those lucky dogs are lucky to have you. You gave her everything that she needed and deserved even in the end when it just about broke you. I'm so sorry for your loss. I suspect (like me) you won't make it any farther than the bridge. Run fast, run free and be free of pain Heidi. See you at the bridge. What an Amazing soul you are! Thank you for what you do to make the world a better place! Thank you for sharing, Ashley. The only thing that helps my heart when I have lost my "babies" is that I know they are now some place good and beautiful. They are finally somewhere they can be happy and never hurt again and their spirits are free...but always close by. I had to say goodbye to my Annie a couple years ago...she was the love of my life for 14 years and I thought I would die...but I had to do it for her...she was so sick and an inoperable tumor on her back...when the vet came to my house, Annie stood up and walked to the door to greet her. Amazing, as she could hardly walk anymore due to the tumor on her back. She knew and she wanted me to know it was okay. I have her pic on my computer screen - sitting there smiling like she ALWAYS did...and I talk to her every day. And...I know she hears me...much love to you, Ashley. Ashley, for the third time this week I'm sobbing at reading your blog. I'm so sorry for your loss. You loved Delilah and Heidi with all your heart - thank you for being there for them. You are an inspiration! Ashley, what a wonderful gift of life you gave to that precious girl. 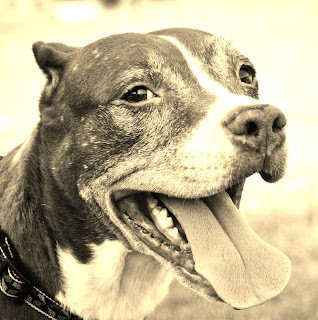 Be proud and know that during that year you gave her happiness, strength and love that all pet owners should provide. You had to do the hardest thing next to planning a funeral for your own family. 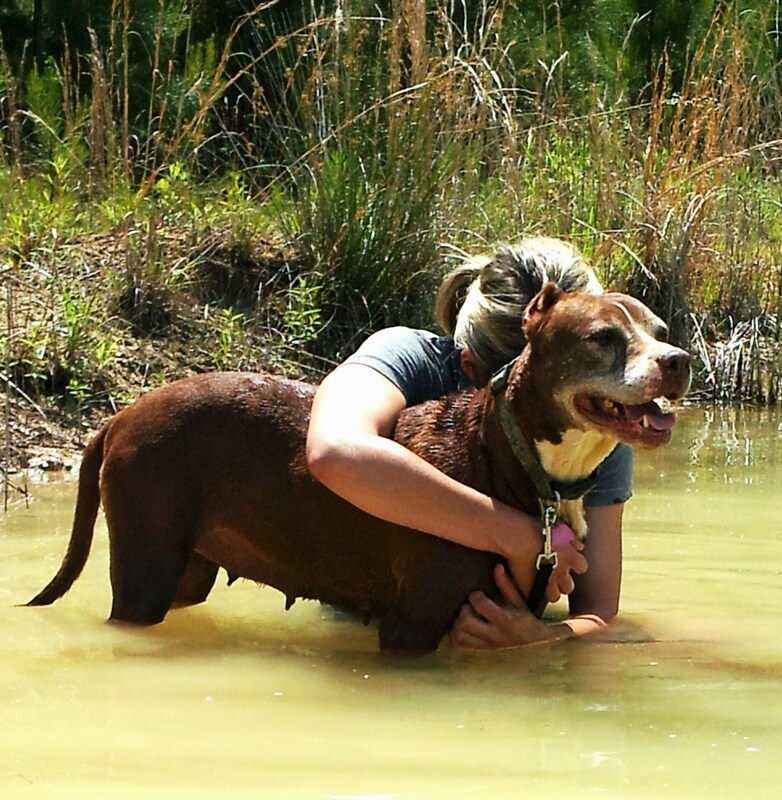 It's such a honor to read that story, and know yes, that they are people out there who really love their animals so much, that the only thing that truly helps is the passage of time. Look around you Ashley, look at everything that reminds you of her, look for the signs she is there with you. Know that YOU were the ONE, SHE PICKED YOU! I am so happy for Heidi that she had a complete year of knowing your love & kindness. She must have felt like a princess! I know your pain is great...I rescue cats & kittens and when they do not make it I cry like a baby. I cry for the animals that die on the streets, the ones who never get a chance to know human kindness & love. The ones who die of starvation, disease and injury. I have six dogs also who are loved very much! We call ourselves Kastaway Kitties & we love and care for them every day. I know you will miss Heidi very very much but know that she is proud of WHO you are and WHAT you do! Thanks Ashley! I went through a lot of tissues reading this story. I rescue and when I have to make those decisions, I bawl too. Heidi may have only been with you the last year of her life, but it was the best year ever for her. She had a chance to know what real love was, and tenderness, and care, and although only for a short time, it was the best time for her. She will be waiting for you at the bridge, all healthy and happy, and loving. And grateful that you had the strength and courage to help her at the end when she needed it most. It was the most unselfish thing you could ever do for her. Animals are lucky there are people like you and Caycee to look after and care for them, and help when it is needed. I am sure God has a special spot in heaven for people like you. I know you're sad and your heart is broken, but I am so happy that you exist in this world. Without you these beautiful creatures would never have known love or caring. Thank you for rescuing Heidi and for letting you fill her last year with the love that she deserved. Oh Ash ((((((hugs)))))) Heidi hasn't gone anywhere. She is closer to your heart than this physical world ever let her be. Hugs sent to you all the way from Minnesota. You are an amazing person and a true angel. You give all these dogs life even if for just awhile it's more than some have ever gotten. You are a hero, a strong woman, a savior, a women that we need more of. Thank you for taking care of Heidi and all the others. Thank you for taking care of my baby Brutty and his siblings. And thank you for taking care of any other's that come into your life. This is the saddest, sweetest and most heart breaking story ever. What you're doing is phenomenal. That just broke my heart. I think you are such an amazing woman to take in animals who wouldn't have a chance other wise. Your a Blessing doll. She feels no more pain. And the fact you put aside your heartbreak to take her swimming on the last day AND jump in the lake with her, wow. Im praying for you. Thank you, Mrs. Susie. You always have the sweetest words during my difficult times. I am sorry for your loss. I have lost so many dogs and I miss them forever, too. I have lost dogs thirty years ago and the loss is still with me but there is always room in my heart for a new dog once the grieving is over and the healing begins. I lost my sassy two years ago and I am just now thinking of getting another little lap dog. You will always miss Heidi but you will still have enough love in your heart for another dog, some day. you are such an inspiration. We know the pain of losing two babies in the course of 2 weeks. It's the most painful experience one can have. Luckily, I as you, had someone there with me to feel the pain as deeply as I. My husband got me through that time, and I him. We have a house full again now... 2 beautiful dogs, and 3 crazy cats - one of whom is elderly and in the beginning of the end. As I write this I am still crying for you, for Heidi - the most precious of precious little girls. How lucky she was to find your love, to have someone to give her love to. Thank you, and God bless you. The pain will always be there, but so will the love. I'm in tears as I type this...you are such an amazing person....We lost Olive, our 12-year old French Bulldog, almost 2-years ago....it is still heartbreaking to me...God bless you! So sorry for your loss Ashley, I lost my Pouncer Roo 8 mo. ago tomorrow and I still cry for her. Ash, as I type this out I have tears running down my face because I know what you are going through, it is hard but we know our babies are watching and waiting on us to rejoin them. Just know Heidi and delilah are together running and jumping like the beautiful girls they are. They will be forever in your heart as well as all of ours. You never cease to amaze me (and you never cease to make me sob like a baby)!!! You are truly Heaven Sent! I am so sorry for your loss...I know that pain ALL TOO WELL! I just have to remind myself that "it's better to have loved and lost, than to never have loved at all"! God Bless You for all you do for the animals! I wish I was half the person you are! You are such a warm, ray of light in such a cold, dark world! Thank you again! I am so sorry for your loss!! I don't know you and didn't have the joy of knowing Heii but I do know the pain that you are in!! My husband & I rescued 3 kitties. Our Largest beautiful yellow tiger (named Hunter because he was hunting for a home) had been terribly abused when we got him. Someone had set him on fire!! He was sick,starved and in terrible pain! We loved him unconditionally and slowly he learned to love & trust us back. He was sooo amazing!!! We live on an island off the Maine Coast and he had a wonderful life for the past 5 years but this week, we lost him to a coyote in broad daylight!! My heart too is broken and the pain is unbareable!!! Our other 2 kitties don't understand where he has gone and that is gut wrenching to watch. I can only saw to you that you are a wonderful woman for ALL that you do and that I am sending prayers for peace in your time of loss! May God & Heidi's spirit be with you always!!! I to know what it is like to lose a Heidi. I had my little schnauzer girl for 14 years. She was my first pet as a kid and I was away at school when my mom called me and said that Heidi died. I was home that weekend before she died and I will never forget, I just sat by the chair she always laid on and petted her. Now that I look back on it I think she was waiting for me to come home from school to see her again because she died on that Monday. I am so sorry for the loss of your dog. Even though it was only a year I bet you made this the best year of Heidi's life. She could die in peace knowing that someone cared about her and loved her. I bet if she could talk she would say thanks for giving me a real family. Dear Ash, I am so sorry for your loss, to say I know how you feel some how does not sound appropriate. I had two little baby kittens that were sick from the first day I got them, and over the years and countless vet visits and mountains of bills, I knew I would never change a thing. For the longest time I thought I was saving them, but in my heart I knew they were saving me. I put down my last angel sammy ( samantha) in february and all I could think about was how I wanted to join my angels and be with them. Pieces of my heart and life were gone and I doubt they will ever be filled with that kind of love ever again. As I contemplated stupid things to make the pain go away, I ran across your site. And in a world where sadness, pain and suffering is shoved down our throats by the politicians and news cycles, you reminded me of the love that my angels gave me and hopefully I gave them. As I stood outside and watched my rose bushes blooming and my first oriental lilly open up, I thought of you as words can not describe the beauty of a rose and the scent of a lilly, words can not describe your heart. I did take in another traumatised kitty that they say is hopeless, and to wild to save and will never let you touch her or be a happy healthy normal cat and all I can think is at some point in my life someone has said the same thing about me. And my little traumatized kitty, turns out that little kitty after 10 weeks is full of love and wants attention and to be petted 24/7 and never leaves my side. Thank you for all you do Ash. When I lost my Max 2 years ago, a large part of me died with him. Every time we lose one of our babies, a piece of our heart goes with them. I'm sorry to say I could not read your entire post ~ it reminded me far too much of what I experienced as well. I'm so incredibly sorry for the loss of Heidi. You gave her THE best year of her life; she felt loved & was lucky to have someone such as yourself to show her what that was like. you are not crying alone my heart aches for you I don't know how you do it but you are truly special soul. Wow. I am glad I'm alone in the office today because I'm sobbing. I lost two dogs in two weeks last year so I know how ripped your heart is at this point. In fact, I lost my sweet Buddy (age 10) on May 11, 2011 (and his brother Bucky (Age 13) on April 27, 2011). Thank you, Ashely, for giving these dogs a chance to know love. I am so sorry for your loss. My heart breaks for you. You are such a special mom to your babies. Thank you for all that you do to make their lives happy. I appreciate you sharing your life stories with your babies. It makes me appreciate and love my babies even more. God bless you! I sobbed through your very beautiful and touching tribute to Heidi. I relived 10/4/2010, when I had to put my baby boy, Mingus, to rest. I think of him every day since, but reading your story made me play out minute by minute of that fateful day. Mingus was only 4 years old, but he was born with congenital idiopathic megaesophagus. He's had many bouts of aspiration pneumonia throughout his life, but he wasn't able to get better this last time around. It's devastating to lose your pet...when it's people like you and me, it's like losing your beloved child. And it's ten times worse when we're the ones that have to bring death to them. I went through so much guilt...feeling like I haven't done enough for Mingus...that I gave up on his life before he was ready to. I felt like my life was over...I didn't know how I would go on. But that wonderful Mingus! He made me feel better and gave me peace. He let me know that I did everything I possibly could and assured me that we will meet again someday. When I was grieving, someone gave me these comforting words..."You showed ultimate love by taking away his pain and making it your own." I say the same to you. And Heidi knows that. They all do. Heal your heart...take comfort in loving memories of Heidi...and keep on saving lives in honor of those that have gone on to heaven. Thank you for all that you do for our animal friend. Your are truely an angel sent down to the unjust and unkind world to help fight the good fight. As long as there are people like you who give every ounce of theire being for such a just cause there will always be hope. Your deeds help to inspire others. I have always been an animal lover and sensitive to all animals plights. But now when I pray I tell our Lord that I will selflessly pledge my spirit up in Heaven to serving all the animals whose life on Earth was lonely, unjust, and painful. That I know is my purpose in life and in death. May God's grace shine down on you always. Dearest Ashley .. I just read about Heidi and as I read, the tears came down. First of all, I THANK YOU for rescuing Heidi from those horrible conditions and then, for giving Heidi the Best Year of her life. 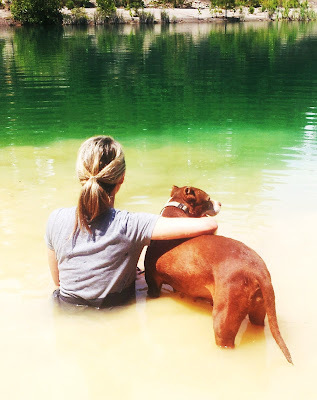 Heidi knew you loved her with every beat of your heart and she loved you too .. it showed in the pictures and the ones with you in the water with Heidi ... precious memories ... Ashley, I have a rescue Pitbull named Cupcake who had both her ears mutilated at 4 weeks of age and then tossed away like a piece of trash. Thankfully Almost Home New Mexico rescued Cupcake and then after a few weeks .. I was the "chosen one" to be her daddy. 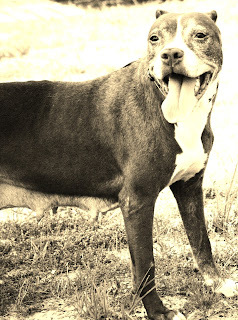 She has been a blessing to me since my older son Pitbull (Sammy) passed away in 2008 .. she came into my life July of 2008. I know it was Sammy who had me "watch the 5:00 o'clock news" about Cupcake. I never watch the 5:00 o'clock news .. and this day I did and there was Cupcake .. a 4-week Pitbull puppy that had her ears mutilated and I fell in love instantly knowing that Sammy was the one who brought her to me. I lost my dog Reo 6 years ago. It was the hardest thing I had to go through. I miss him everyday! You are a special person, and thank you for what you do. when you think of the day we said our good byes. when you let me go, my soul flew like a dove. I'll be in your heart, we'll always last. for just think of me and all the joy that we had. I'm not that far, I'll see you in awhile. it's an empty room when you call out my name. you feel it inside, as you wipe your tear. I'll always love you, for you were my dad. you held my paw tightly and cried out no. I feel happy and free, but I don't see your face. our pain is all gone, but there is still hurt each day. I am looking for you, but I don't hear a sound. forever together, we can now rejoice. I'm sorry, I'm so sorry. That was heartbreaking to read and I couldn't help but cry for your loss and the losses of others and the ones yet to come. But, I'm glad Heidi had you in her last year, she deserved your love and the chance to love you back. You gave her a wonderful gift. And, you're such a strong person for what you do. Ashley, I cried reading the entire story. I went thru the same thing a couple yrs ago, I had to put down my best friend...my 6yr Dobie..Levi. He was my world. I rescued him from a puppy shelter at 7 months all spindly and wormy. I got the best 6yrs with him. There was an unconditional love that was undeniable. He was diagnoised with stomach cancer when he had problems pooping. I was told it was already too far and to put him down. I couldn't do it. I kept him going for 3 more months and spent every moment with him, cooking his foods and cleaning his mess's walks every day till his energy just couldn't do it. I knew it was time, but I didn't want to let go either. I took him to the vet and had the same talk, I love you, I will miss you and it was time to rest and no more pain. Close your eyes now and sleep, momma's letting you go to sleep without pain now. As he took his last breath, I lost it. I cried like a baby...I miss him so much to this day. I still cry when I speak of him. I can't see how some people can just do that to animals without feeling that pain. It's etched in my heart. I adpopted a female Dobie from a shelter, 9 months old with 1 eye. I love her to death. I pray every day nothing happens with her, I don't think I could bear to lose this one..she is 2 1/2. I also have a 2yr male pittbull mix...who is adorable and the sweetest boy ever. Love my babies! God Bless you little one. I can relate to your pain. It fades, but never goes away. I'm glad that your Heidi didn't die alone. She knows her mommy loves her, and she will continue to watch over you everyday until you are back with her. Something will pop up out of the blue and you will know it is her saying "hello Mommy, I love you"
I am so sorry for your loss and so proud of you for your strength. I have a 17 year old Chihuahua and a 15 year old Minpin. The oldest(ChieChie) has went blind and deaf and the Minpin (Starr) is blind. I hope and pray I will have your strength when their time comes. Right now, I just cant let go. God bless you and sweet Heidi. You gave her a lifetime in a year. We have all said goodbye to our friends. They live forever in our dreams and memories. These words to me say it all about how dogs love us, if any words can. Oh Ashley, I cried as when I had to let my little green-eyed, black Siamese go on without me. She was 18 1/2 years old and her name was Skeeze. Unknown to me and the vet, a painful Squamous Cell Carcinoma had, over time, destroyed her zygomatic arch. I was horrified --I never knew cancer was slowly taking my kitty-girl from me. Such an ugly name... cancer. 12/10/2000: Everything we did and said was as a thousand times before during the last day, those last hours, our final minutes...until the crushing thought that took my breath away: "everything we do and say is "for the last time". I held her close and smelled her kitty fur and her breath as she poked her nose into my lips and my nose (for over 18 years always her way of saying "I love you"). I inhaled her last breath then breathed into her the words "Thank you Skeeze - I love you too". Ashley, in our life time there WILL be another Skeeze, another Heidi, and others like my beloved one-of-a-kind Ollie, Patches, Bones, Alexander, Anthony, 4 Socks, Mr. Pie, and Daisy.... much loved, but gone too soon -- be it 1 month or 23 years. And we will give them all the love our hearts hold, and they will, in turn, give us theirs. Dear St. Francis - please hold Heidi next to your gentle, loving heart as you show her the light over the Rainbow Bridge where she knows she will be happy and healthy and have lots of friends as she waits to meet again, those who loved her. Well, like everyone else I'm sitting here bawling... like someone said, you took her pain and made it your own, and you shared this so you could share that pain and hopefully all of us can take a little of it from you to ease the pain you are going through. You are truly an angel here on earth... your love for these babies is palpable in every word you type. I am sitting here holding my two rescue babies and telling them all about you, in some strange way, they seem to get it. We ALL pray for you. You take the most horrible situation imaginable and lose your selfishness, which is so hard to do... you remember the love they gave YOU and in turn, you give them comfort and peace when they need it the most rather than allow them to suffer... that alone takes more strength than most of us have, and that is a clear indicator of the unconditional love you have for every single one of your babies. It's so hard to say goodbye, but it's not fair to keep them alive for selfish reasons... because we love them. You have proven time and again that the difficult decisions ARE made BECAUSE we love them. May God wrap you and Caycee in his loving arms and provide you peace and comfort... exactly what you both provided for Heidi. God bless you, I remeber when my friends dog was put asleep. A few months before, he was loving, loyal and affectionate, only thing was.... the (crazy) woman behind their house, didn't like Oreo. Well I understand Oreo isn't everyones cup of tea. But what pissed me off is that , one dark cold winters night, she climbed the wooden fence and had put Borax in his food bowl that sat outside. Well that had poisened him.It had got to the point where he was suffering, SO much that a doctor put him "down" in the back yard. I loved that dog! He was a kinds little gentlemen, much more kind than those "hogs" that are two legged!Well I better go before I cuss that stupid red head, who dosn't have a soul! My heart goes out to you. I know how you feel..I have done exactly what you have done a lot in my life with all my babies and when I read your blog about Heidi, it brought all it rushing back to me. It's not easy to say good-bye to our babies, but because we love them so much, we don't want them to suffer anymore. We do what we do out of love and respect, and they know that. I know Heidi is looking down on you from Heaven and giving you that "smile". She will never forget what you gave her for the last year of her life. Her love will surround you always and will help you with other abused and abandon dogs to give them the love you gave her. She will always be your guardian angel. May God give you the comfort and peace you need during this time of grief, but know that Heidi is in no more pain or suffering and she is back to her beautiful and perfect self. You are an amazing woman and don't ever forget that. These animals depend on you and are waiting for you and Heidi and Delilah will help you in this endeavor. YOU are their guardian angel and you give them what they have been wanting and waiting for their whole life. You are an inspiring woman and I tip my hat off to you and what you do. You are the BEST!!! Love and hugs to you!!! God Bless You Ashley. Heidi has surely crossed the Rainbow Bridge and is romping and playing in that beautiful green meadow with all her friends - no more pain, no more suffering, no more cruelty at the hands of humans. She will be with you always both in memory and in spirit, you were the only one to show her real love and kindness. You are an amazing person,as Heidi was an amazing dog. I cried all thru reading your story. In every picture,Heidi looks happy and smiling. You gave her that. Isn't it something that a dog can go thru so much horror and still smile? I am so sorry you two didn't have more time together. RIP sweetheart, you were loved. God Bless You for Rescuing Heidi and showing her the love she so deserved! May you take comfort with the many wonderful memories and knowing Heidi knew love for a year! My thoughts and prayers are with you! Hugs! Its never easy is it. My last dogs name was Benji. He was a wonderful friend but at the age of 12 he got bladder cancer. Our last walk I had to carry him back to the house.He tried so hard to walk but could not. I kept telling him I love you and its OK.I took him to the vet and they said their was no hope and said they would keep him over night and call us in the morning. But when they put him in his cage he died. They called us the next day and told us what happened. I truly think they put him down to save us the agonizing decision because we were a mess. I picked him up the next day and they were kind enough to let me see him before they put him in a bag. I burried him in a rain storm also.Always remember that all dogs go to HEAVEN.They are put here for us. To teach us how to love and their is no bad dog. Only bad humans make a dog bad. i know how you feel i had to put my sweet Kandie down in 07 she had cushings and i took her to the vet and i cried and cried. amazing story, you gave so much to Heidi and she gave you even more in return. Hey Ash, I am truly saddened for your loss. You are truly an amazing human being and I would be proud to know you! I am sure that Heuidi's last year with you was the only year that she felt alive and happy. I too have a wonderful dog and she is by my side whenever I am home. I surely know that what you do is something that God instilled in you to give back to the sick and suffering animals that are helpless. They didnt ask for anything buit they give unconditionally. God Bless you in every way!!! YOU ARE A TRULY AMAZINC,STRONG AND UNSELFISH PERSON.I HOPE ALL PET OWNERS READ THIS AND REALIZE THAT IF YOU LOVE YOUR PET DO NOT LET THEM SUFFER.I DONT EVER WANT TO HAVE TO ENDURE YOUR PAIN BUT I KNOW THAT SOME DAY MY PRECIOUS BOOBOO'S TIME WILL COME AND I PROMISE I WILL NOT LET HIM SUFFER.YOUR STORY HAS TOUCHED ME SO DEEPLY THAT I MUST GO WASH MY FACE AND BLOW MY NOSE.ONCE AGAIN THANKYOU FOR THE COURAGE TO SHARE YOUR STORY.AND REMEMBER IF YOU LOVE YOUR PET AND THIER SUFFERING SEND THEM TO PLAY WITH HEIDI CAUSE IM SURE SHE WILL FILL THIER HEARST AND TAKE CARE OF THEM. I too feel your pain for it was this past Mother's Day that I lost my beloved Corey. He was a champ. Always there for me in good times and bad. I truly believe that we will see our friends again and it will be the most joyous reunion. Ahh, to play ball, take a bath in the snow, and just to hug and kiss that sweet lovable face. God Bless you for all your hard loving work. You are an angel. You are amazing. Thank you for expressing your (my) feelings so well! What a beautiful, moving tribute to your wonderful Heidi. You will be together again eventually. Thank you for loving Heidi and for all you do. I am litterally in tears right now. This is a great way to remember Heidi and get your emotions out. You will see her again, because with your big heart, you will definately be able to live in the paridise earth that is coming soon when all this sadness ends and they dead will be awakened, and the earth will be beautiful. So you and Heidi will be able to run and play forever because the bible says that during that paridise "death will be no more." If you want to know more about this "paridise" I'm talking about contact one of Jehovah's Witnesses or go to JW.org. I wish I had the money to buy you that lake..............you could name it "Lake Heidi". Your story is as usual, too beautiful, and is a major tissue alert!!!! Thank you for resharing Heidi's story. I came across your blog through an Atlanta friend (who works with rescue dogs) posting this blog post on FB. I am in tears, but then I looked further since it said that you were helping dogs in Mississippi. And then, I realized you were in Meridian. My husband and I just decided a few weeks ago to move to Meridian for his job. I can't wait to come to Lucky Dog and see all the good work you are doing. And do what I can to help. I'm sorry for your loss of Heidi and Delilah. It is so hard to lose one, much less two. I lost Shelby, my foster dog, recently, due to severe seizures, and I miss her like crazy. It helps to know so many people care, so I wanted to let you know that you're not alone in your pain. I'm glad you have such a good friend to be there for you. Hugs! I am so sorry :( I dread the day that I'm going to have to say good bye to my boy. He'll be nine this year, and he's been with me since he was a year and a half. The very thought of saying good bye makes my stomach turn, and makes me want to cry. DANG IT GIRL.....I am sobbing at work. You are one of a kind. One of a kind and you mean every single damn word. I don't know you, but I LOVE YOU. AMAZING. Ugh, I'm so sorry. I just found your blog today and read about her rescue, then just read this page :( I'm crying and I only knew about her for less then an hour. Thank you for making her last year being loved and cared for. She looks very happy in all of her photos.